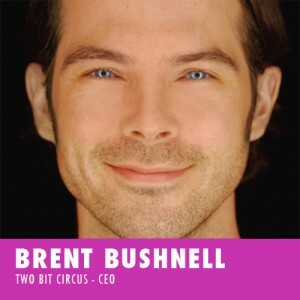 Brent Bushnell is the CEO of Two Bit Circus, a Los Angeles-based experiential entertainment company building products and events that combine story and technology. Most recently the team launched STEAM Carnival, a showcase of high-tech entertainment and workshops to inspire invention. They also built a 360 video production pipeline and deployed Virtual Reality content with haptic feedback for live events with clients including NFL, NBA, Indy, Olympics, Sundance and more. The company regularly serves as immersive entertainment partners for brands and location-based facilities. Previously, Brent was the on-camera inventor for the ABC TV show Extreme Makeover: Home Edition. He was a founding member of Syyn Labs, a creative collective creating stunts for brands like Google and Disney and responsible for the viral hit Rube Goldberg music video for OK Go which garnered 45 million views. Brent is board president of the non-profit Trash For Teaching which upcycles clean corporate waste for school art supplies. He enjoys mentoring teens in entrepreneurship and publishes on Twitter at @brentbushnell.